A slow start – impenetrable style – but the going got easier as this account of attempts to climb the North Face of the Eiger progressed year by year. 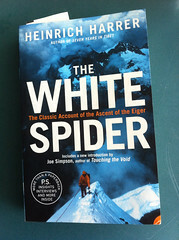 Heinrich Harrer, of Seven Years In Tibet fame, was in the group of climbers who made the first successful ascent, in 1938. “Those hours between night and day are always a keen challenge to one’s courage. One’s body goes mechanically through the correct movements essential to gaining height; but the spirit is not yet awake nor full of the joy of climbing, the heart is shrouded in a cloak of doubt and diffidence….